My sisters turned Grandma’s old Armchair into something new and fabulous! Tackle that upholstering project and have furniture you love! I have to start by telling you that I did not do these amazing chairs. 2 of my sisters each reupholstered an old armchair that belonged to our Grandma. Both turned out so amazingly fabulous that I had to share them here. I am sorry there is not a tutorial here, I honestly have no clue what they did. But I did want to share the journey because I thought it was a fabulous transformation. You can check out my sister Tracy’s post on her blog here. It all started with two yellow chairs. These two chairs sat in my grandma’s house for as long as I can remember. My mom actually remembers helping my grandma reupholster these chairs when she was little. She got to hold the tacks as my grandma nailed them in. So I honestly have no clue how old these chairs really are! About 2 years ago my grandma passed away and these chairs were passed on to the two of them. They had big plans for them. Fast forward to now and they finally decided it was time for them to make their big plans a reality. My mom has a big open basement so they brought the chairs to her house and met up several times so they could figure it out together. Their first task was to strip the chairs of the old yellow fabric. I don’t know why, but I love how these naked chairs look. It’s like looking at something that is rarely seen the inside of your body. Neither one of them had ever reupholstered anything before so they really helped each other and learned from each other’s mistakes. They stayed on the same step on both chairs for most of the way so they could help each other. Didn’t they turn out fabulous! My sister Carla even talked my mom into buying a chair to reupholster. The funny thing is she ended up buying a new chair to tear apart! I think I am definitely going to be on a hunt to find a fun chair too! 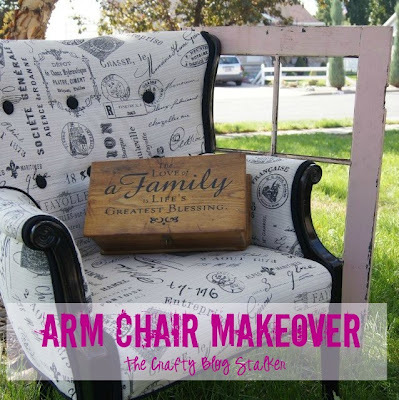 SAVE ARM CHAIR MAKEOVER TO YOUR FAVORITE DIY PINTEREST BOARD! I agree that these two chair turned out AMAZING! They turned out beautiful. I would love to learn how to reupholster something. Oh my gosh, those are gorgeous! I’ve never reupholstered anything, either, and now you’re making me want to tackle the awful (but comfortable) chair-and-a-half in our living room. The fabric’s split on the arms and back, but rather than try to reupholster it I’ve been strategically draping throw blankets over it. At this point, the thing’s starting to look like a pile of dirty laundry! They both turned out gorgeous! Both of them unique and pretty – great job you sisters! Thanks for sharing your creative inspiration with Sunday’s Best – you helped make the party a success! These are amazing. I love what you did. I have a link party on Wednesdays, and I would love it if you would link this and any other posts. It is called Wednesdays Adorned From Above Link Party. It runs from Wednesday to Sundays. They really look fabulous. Love the black and white fabric! LOVE them! Such a fabulous job! I have really been loving that printed fabric look lately, just haven’t convinced myself to invest in a chair with it. Your sisters did a fabulous job Katie!! Those chairs came out fabulous. I love the printed fabric one on the left, very unique. They are even more lovely when you know the story behind them, that they were passed down from their grandmother. Love the before and double after! Nice! Thanks so much for sharing with us at Someday Crafts! I’ll be featuring your project tomorrow morning on our blog! Thanks for the inspiration! What talent! I LOVE the script chair!!!!!!!!!! That must be a lot of work but the chairs turned out tres chic! Thanks for sharing at passion parade! Have a great day! WOW, both turned out fantastic. I’m so impressed and I really love the fabric choices for both. Wow, your sisters did a wonderful job! I liked how you shared their journey even though you didn’t do it. Thank you for sharing at Hookin On Hump Day! These chairs are great! I love the black and white fabric against the black trim! Those turned out SO good! Drastic difference between the before and after! Love your blog and I am now your newest follower! absolutely gorgeous and so different! Thanks for sharing. Do you know where your sister got the black and white fabric? Great job! They look awesome! I have done some chairs similar to those, and I know it is a lot of work! Love the colors! Visiting from You’re Gonna Love It!!! Wow they are incredible and what sweet sisters you have! I love this. Come link up to Centerpiece Wednesday and share this with us and enter my giveaway too! Beautiful, each very unique and very pretty. Great job for two who never upholstered before. Thanks for sharing your creative inspiration with Sunday’s Best – you helped make the party a success! Great job. Thanks so much for linking up to Tasty Thursdays on The Mandatory Mooch. I hope you will link up again. The party will be live tonight. WOW!! Those both turned out fantastically! Your sisters are just as talented as you. :) Thanks for sharing with us at Link It Up Thursday. I love love love the black and white one. Kudos to them for tackling these. Thanks for sharing on Tout It Tuesday. Hope to see you tomorrow! Would love to know how they fastened the buttons in the chairs. That’s been my hold up. I want to do my chair and sofa, but don’t know how to do the inset buttons. Help please. They turned out fantastic!! Wow! Excellent! Love the new look! Both of your sisters are so brave to do the upholsteringand it turns out amazing…. Wow! They look absolutely amazing and so new with the new fabric! Oh my gosh–I’m in awe of their skills…can I borrow them?? 😉 Gorgeous makeovers!